On June 12, 1962, George Lucas was in Modesto, California, driving home to his family’s ranch. As Lucas waited to make a left turn, his Fiat Bianchina was struck by a speeding motorist and flipped into the air. Lucas was thrown from the car, which saved his life, but crushed both his lungs. Before the crash, the 18-year-old Lucas dreamed of becoming a race-car driver. When he finally recovered from the accident many weeks later, that dream was dead, totaled in the wreck along with his beloved Fiat. Lucas eventually attended Modesto Junior College and then the University Of Southern California, where he found a passion to replace racing: cinema. Ten years later, he combined the two in American Graffiti, his second film as a director, and his first massive success. It follows four high-school friends—class president Steve (Ron Howard), pensive Curt (Richard Dreyfuss), drag-racing champion John (Paul Le Mat), and nerdy Terry “The Toad” (Charles Martin Smith)—on their final night cruising the streets of Modesto before Curt and Steve leave for college. It’s remembered for helping launch a massive wave of 1950s nostalgia in 1970s popular culture, inspiring imitators on film (The Lords Of Flatbush) and television (Happy Days). 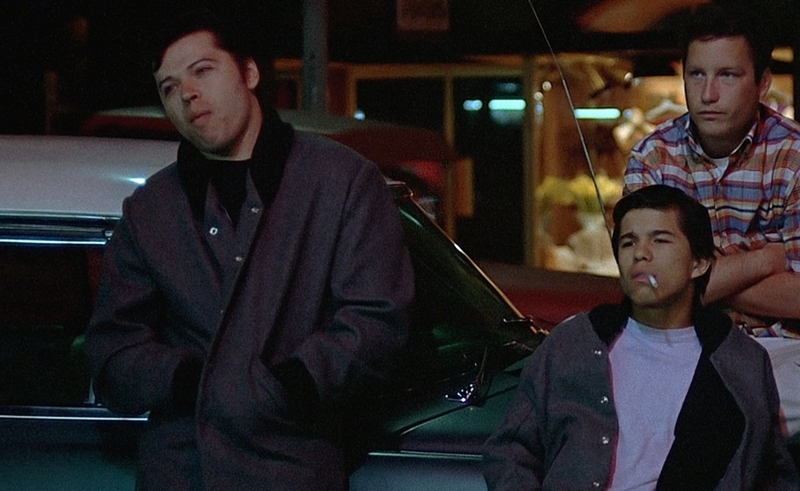 But American Graffiti isn’t actually set in the 1950s; it takes place in 1962, just a few weeks after Lucas’ accident. This is the secret to American Graffiti’s success, the reason it resonated so strongly with viewers in 1973 and every generation since: It isn’t simply a nostalgic movie, it’s a nostalgic movie about nostalgia. Lucas could have set the film in 1959, when Steve, Curt, and John were still in high school and still cruising night after endless night. Instead, Graffiti begins right as the fun is about to end, and gives its characters just enough self-awareness to recognize that this is last call at the party. George Lucas isn’t the only one mourning for this magical lost era; the characters onscreen mourn right along with him. 1962 was a fortuitous year for a young American like Lucas to lose his innocence. Soon, the entire country faced similar disillusionment. A year after Lucas’ (and American Graffiti’s) accident, President Kennedy was shot in Dallas. The Vietnam War quickly escalated, claiming tens of thousands of American lives. Martin Luther King Jr. and Robert Kennedy were both assassinated in 1968. By the time American Graffiti was released in August 1973, the Watergate scandal was in full, ignominious swing. Like Lucas’ Star Wars, a futuristic movie anachronistically set “a long time ago in a galaxy far, far away,” American Graffiti is a chronicle of a simpler time that has since vanished from the universe as if it never existed. And like Star Wars, it follows a teen as he contemplates leaving behind his provincial hometown for an exciting destiny elsewhere. Lucas has said in interviews that he wrote Graffiti because he felt, amid the darker and more depressing cinema of the New Hollywood era, that it was time for “a movie where people felt better coming out of the theater than when they went in.” That may have been his intention, but his execution is a bit more downbeat. Individual moments are happy—Curt meeting his idol, radio DJ Wolfman Jack; John and his young partner in crime (Mackenzie Phillips) covering another car in shaving cream—but the overall mood is melancholic. The film begins at a drive-in full of gleaming, pristine cars, and ends overlooking a fiery, mangled wreck. At times, the cars’ slow, orderly parade down Modesto’s main drag doesn’t look like a mid-century mating ritual, so much as a funeral procession. The project’s other important origin was a challenge from Lucas’ friend and frequent collaborator, Francis Ford Coppola. Lucas’ first film, the cold science-fiction picture THX 1138, was met with little enthusiasm from audiences or Hollywood executives. For his follow-up, Coppola suggested Lucas try to make something a bit more mainstream. The son of a practical shop owner, Lucas understood that he wouldn’t have a career in filmmaking for long if he kept making impenetrable science-fiction movies. So he returned to his youth, and his love of car culture and rock ’n’ roll, and wrote the first treatment for American Graffiti. From the perspective of 2014, it may look like Lucas took Coppola’s advice and sold out with abandon. In fact, Lucas stayed closer to his roots as an experimental filmmaker than it now appears. Though American Graffiti’s structure—a day in the lives of a small group of teenagers whose separate adventures are intercut to create an web of interconnected narratives—has been copied many times in the 40 years since American Graffiti premièred, back in 1973, there was very little precedent for what Lucas was doing. Everywhere Lucas turned in Hollywood, he was met with skepticism. Executives told him to focus on just one main character, rather than four. They said the narrative needed more action. They claimed no one would sit through a movie that was wall-to-wall rock music. Every studio in town turned Lucas down, until finally Universal agreed to spend around $700,000 on the film (the equivalent of $3.7 million today) on the condition that Coppola, who’d just made The Godfather and was the hottest filmmaker in the business, also agree to produce it. The gamble paid off; the initial $700,000 returned more than $115 million in ticket sales. Lucas’ experiment was so successful, it essentially invented an entirely new subgenre in mainstream filmmaking. $90,000 of the budget went to securing the rights to American Graffiti’s dozens of songs; Lucas spent so much money on his soundtrack, in fact, that he had nothing left over to pay a composer for a traditional score. The opening credits set the mood: a shot of Mel’s Drive-In and the sounds of Bill Haley And His Comets’ “Rock Around The Clock.” The song’s time motif reflects the film’s life-in-a-day structure, but it also hints in an ominous way at the fact that the clock is ticking on this teenage paradise. For these Cinderellas, the beautiful carriages turn back into pumpkins at dawn, when Bob Falfa crashes his Chevy in a drag race with John. (Lucas shot the scene over and over until he got the Chevy to flip repeatedly on impact—just like his Fiat did in his own near-fatal accident.) John is physically unharmed, but his confidence is destroyed. “He had me,” he mutters, over and over. The ultimate bummer comes in the film’s final scene, as title cards reveal the characters’ mostly sad fates: John dies in another car accident two years later; Toad goes missing in action in Vietnam in 1965; Steve, who decides to stay in Modesto instead of going to college, never leaves town, and becomes an insurance agent. Even Curt, who gets American Graffiti’s sole “happy ending,” and manages to escape Modesto’s Death-Star-tractor-beam-like pull, winds up as a writer in Canada, which implies he fled the country to avoid the draft. His decision to leave is due in large part to the advice of Wolfman Jack, whose freezer busts just before Curt finds him at a nearby radio station. “It’s a great big beautiful world out there,” Wolfman tells Curt. “And here I sit, sucking on Popsicles.” Curt heads out into that great big beautiful world, but like Lucas, he indulges in one final look back. As his plane to school climbs into the sky, he glances out the window. Hundreds of miles below, he spots a lone Thunderbird cruising down the highway. Where it’s going, he will never know. Tomorrow, our Movie Of The Week forum discussion looks at how George Lucas’ idealized yet bittersweet nostalgia piece relates to his other work. And Thursday, Nathan Rabin discusses the surprisingly ambitious, audacious sequel More American Graffiti.